Corruption and drug trafficking are targeted as the main problem of the country and, coincidentally, are the reasons that most embarrassed the Bolivians. 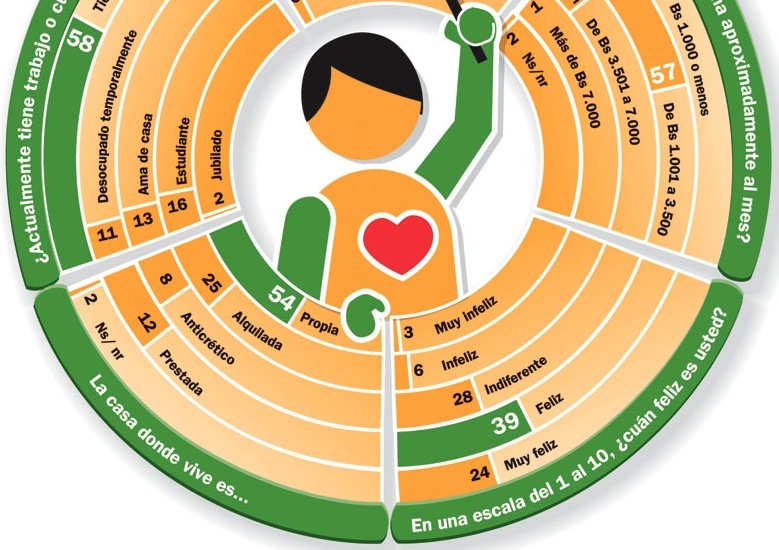 So it reflects the survey administered by Captura Consulting in nine capitals and El Alto city, on the political, economic and social situation that happens country wide. 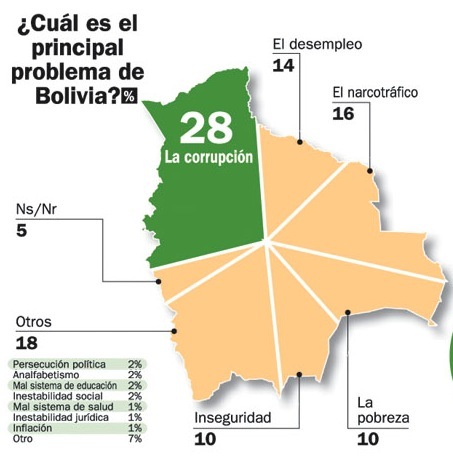 To the question of what is the main problem of Bolivia, 28 per cent of respondents said corruption, while 16% identified drug trafficking, followed by 14% which mentioned the unemployment. 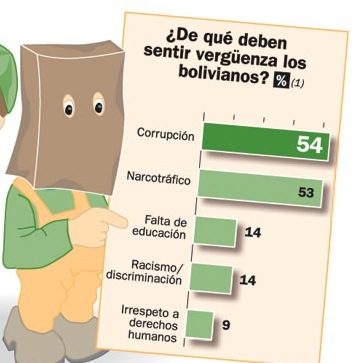 More forcefully pointed out that corruption and drug trafficking are the main causes why the Bolivian people feel shame with a 54 and 53%, respectively. 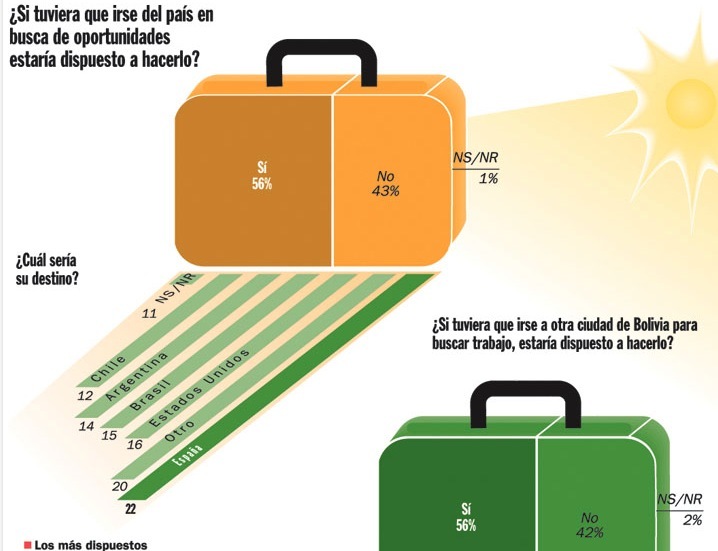 The people of Tarija [Tarijeños] (39%) are those who stand out in first place corruption as one of the major problems. 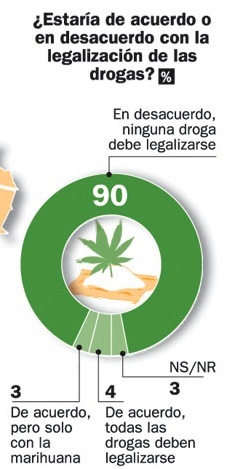 While Santa Cruz (26%) ranks higher drug trafficking, and Potosí people, unemployment. Political persecution is mentioned more forcefully in Cobija (11%), where in 2008 the confrontation of Porvenir occurred, which left dead, wounded, arrested and others sought refuge in Brazil. The sociologist Eduardo Cordova explained that the answer varies according to the characteristics of the group to which it belongs and the experiences. Some may be influenced by the media or personal experience. Cordova said that the perception of corruption in Bolivia fell in the last time, but this year has risen again by the scandal in YPFB. Likewise, he pointed out that those who have more education are those who believe that corruption increased. 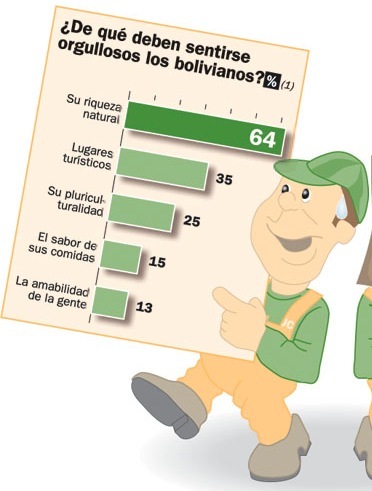 Conversely, among the data that makes Bolivians proud, 64 per cent of citizens considers tourist places are worthy of display. 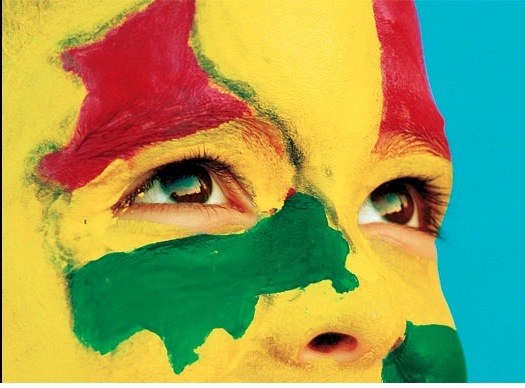 They also highlight the multiculturalism (25%), which shows a country rich in diversity. Added to this is the taste and variety of meals from each of the departments and the friendliness of the people, as one of their greatest assets. Captura Consulting applied 1372 surveys distributed in major cities of the country. Of the total were 300 in Santa Cruz, 200 in La Paz, 150 in El Alto, 150 in Cochabamba, Tarija 100, 100 in Sucre, 100 in Potosí, 100 in Oruro, 100 in Trinidad and 72 in Cobija. Men and women over 18 years of all socio-economic levels were interviewed. The sampling was applied through face to face interviews and using a structured questionnaire. The surveys were carried out between July 20 and 22. The sampling was using probability and proportional to the size of the population (PPT) with random sample points selection and systematic selection of households. 60% of the people who inhabit the main cities of the country has been a victim of a blockade; most of them ensures that it does not participate in the mobilizations, or brings together trade unions and social organizations. This was revealed in the applied survey by capture Consulting in the nine departmental capital cities and El Alto. 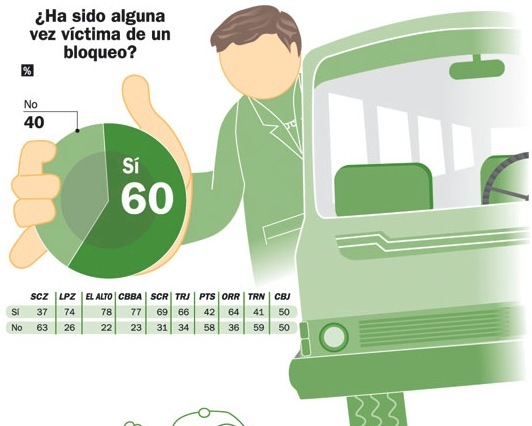 According to the opinion survey, the Alteños are those who suffer most from, with this form of protest (78%), followed by the Cochabambinos (77%). Santa Cruz capital is the one that suffers less by locks (37%). 78% of respondents said that in the past two years they have not participated in marches, blockades, strikes or political demonstrations. Moreover, 82% indicates that does not belong to any trade union, neighborhood Board, fraternity, comparsa or others. The political scientist Alberto Careaga explained that 30 years ago after the return of democracy, demonstrations became an important instrument for pressure groups who did not belong to political parties, although in some cases with this mechanism also arose some parties, such as the movement to Socialism (MAS). According to Careaga, there are mechanisms that were eroded, as ‘an Honorable hunger strike’, which in the past was considered the most extreme measure. With respect to the distance with the unions, says that people who do not feel so many needs generally prefer to be kept out because the leaders have not played a good role. “Many have used civil society for their particular purposes”, he said. The leader of the manufacturing sector, Iver Padilla, ensures that it has suffered many locks on the road to the North, but believed arise by the attentiveness to the social sectors. In turn, Nicolas Chuvé, President of the Supervisory Committee, said that when people do not have covered all the basic services shows interest in participating in their organizations, but have many more amenities at your fingertips, there is less interest. 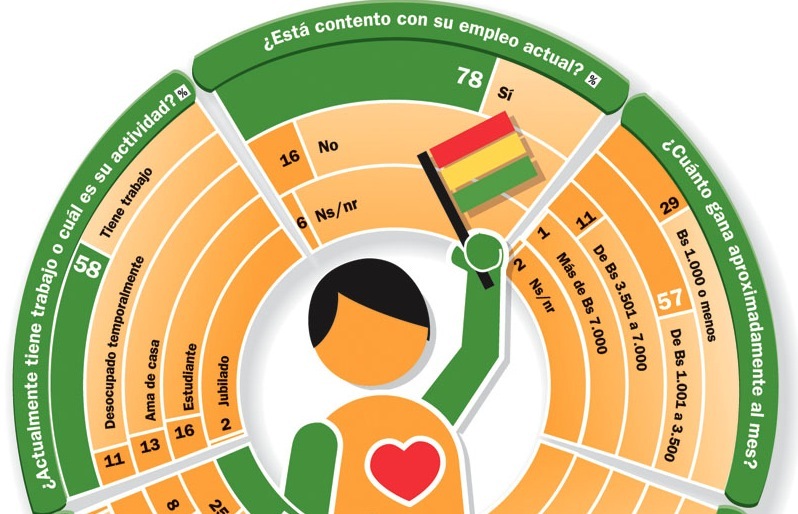 Six of every 10 Bolivians are willing to leave their city, or leave the country in search of better employment opportunities. Nationally, Santa Cruz de la Sierra represents the main option for migrants, while Spain becomes the first alternative for those seeking to try their luck abroad. Thus, reflected in a survey of 1372 people in nine capital cities of Bolivia, in addition to El Alto, between July 20 and 22. According to the opinion survey, young people aged 18 to 25 years of middle class, are those that show more willingness (64%) to seek jobs in other departments. Among those polled, people from Cobija, with 76 per cent, are showing more willingness to seek better living conditions outside of the country. The preferred destination is Spain (29%), followed by Brazil and United States. The capital of Pando, bordering the Brazilian town of Brasilea, boasts more than 30,000 inhabitants and its main economic activities are concentrated in the Commerce and industry of the chestnut. On the other hand, Oruro (80%) were those who expressed more interest in looking for work in other departments of Bolivia and Cochabamba (41%) would be their main destination, followed by Santa Cruz de la Sierra, with 25%. The profile of internal migrants is that of men (58 per cent), youth aged between 18 and 25 years of age (63%) and middle-class. According to the survey, the Trinitarians are persons with more roots to their region. Only 37% of respondents in the capital of Beni said they were willing to leave Bolivia to seek better employment opportunities. On top of that, fewer people (27%) with interest of migrating to another Department in search of work was recorded in Trinidad. Santa Cruz de la Sierra is the main option to receive people from other departments, with 29%. On the opposite side are the cities of El Alto with Sucre, and 1% with 9%, respectively. This entry was posted in Bolivia, Business, Crime and Violence, Drug war - narcotraffick, Economics, Environment, Mining, Politics, Social Unrest, Tourism and tagged Captura Consulting, competitiveness, road blockades. Bookmark the permalink.